Modern consumers are far more health-conscious than their predecessors and with good reason. It can be hard to tell where today’s products are coming from. For those who are concerned about the quality of their water supply, bottled water provides a safe and tasty solution. Here at Tyler Mountain Water, we are proud to introduce Mountain Valley Spring Water to its West Virginia and Eastern Kentucky consumers. What is Mountain Valley Spring Water? This pure American spring water offers what many of its competitors can’t. Mountain Valley Spring Water offers fresh spring water derived straight from the source at Hot Springs Arkansas and is delivered in glass containers to help preserve the water’s delicious, natural goodness. Whether you ’re looking to set up repeat water deliveries for an office or you just want safe and reliable drinking water for you and your family, Mountain Valley Spring Water is the way to go. Why Choose Water Derived From Natural Springs? Although the tap water in some areas is safe to drink, residents of many cities and rural areas may find that their tap water contains excessive minerals or even chemicals left over from the purification process. For those who live in areas where the tap water has been deemed safe for consumption often find that their water has an unpleasant taste or odor indicating that it has high mineral content. This water is known in the industry as being hard water. What Sets Mountain Valley Spring Water Apart? Few companies are as committed to environmental preservation as Mountain Valley. This socially and economically responsible company doesn’t just preserve the spring itself for the sake of protecting its investment; They are also committed to protecting a vast expanse of wild land that covers the natural aquifer beneath. In fact, they have been doing so since 1871. Mountain Valley has a history of ecological consciousness and environmental stewardship that dates back to long before anyone even realized how important it was to preserve these natural resources. How Can Readers Find a Distributor? Those who want to take advantage of Mountain Valley Spring Water’s superior taste and quality will need to find a reliable Mountain Valley Spring Water distributor. Tyler Mountain offers 5-gallon, 2.5-gallon, and 1 liter, is known as a premier water distributor for a reason. 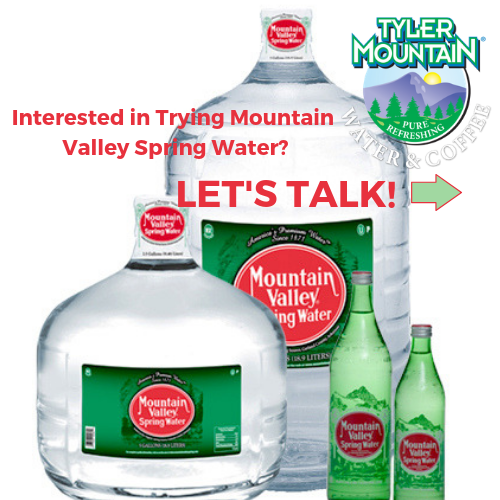 You can trust Tyler Mountain to deliver Mountain Valley Spring Water supply on time, every time. Mountain Valley Spring Water doesn’t just taste great, it’s also healthy. The company cares about more than making money and is committed to preserving the natural world, which is something that we here at Tyler Mountain value as well. These factors combine to make Mountain Valley a go-to for safe, delicious bottled drinking water. If you are interested in trying this product, contact a representative in West Virginia at Tyler Mountain Water today.